Author, A. J. Llewellyn » My Favorite Obsession – Comment to Enter Draw for $10 Amazon Gift Card & $25 See’s Candy Card! I haven’t blogged for a while but a recent author retreat in Pigeon Point–a remote central coast lighthouse here in California– reminded me how much I enjoyed it. So I’m diving in again. We did a writing exercise that prompted this blog and I can’t get it out of my head. We had to write for five minutes on our most favorite obsessions (and our least favorite) and the results were hilarious. I can only talk about my own weird obsession…and I won’t name the author who is into guy’s feet. That’s fine except I had a huge crush on actor Thomas Jane until I learned he walks the streets barefoot. I used to do that because I’m Australian and we’re stupid, then I stepped on crushed glass so the idea of “walkabout” isn’t so hot anymore in the big city. Besides, somebody took a photo of Thomas’s feet and they were dirty! But I digress. I have plenty of obsessions but my main one is Pyrex. Vintage pyrex to be precise. I had no real passion until I came across the nesting bowls pictured above right after I moved to L.A. in 1984. I saw these bowls in a corner of Treasures of Ojai, a fantastic antique store in Ojai, California (and the only one left standing after all the other vintage stores in that cute little country town became art galleries and high-end jewelry boutiques. I bought the bowls because they reminded me of my mother and I remember she had the same mixing bowls. Same colors and sizes. She died when I was six and my grief-stricken dad threw out almost everything we owned, including my books and toys, and my brothers’s things too. No wonder we are so demented. Anyway, I bought the bowls and have used them ever since. 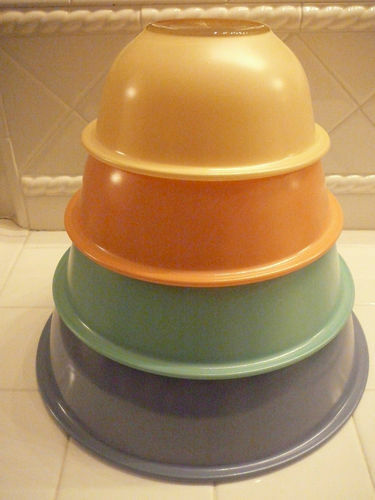 This led to an obsession to mid-century kitchenware I’ve found online. I wonder about who owned the pieces and why they are selling them. I will forever hang on to the ones I’ve purchased because the hold sacred memories–the very few that I have–of my mother. I recall her mixing bechamel sauce. I can still remember the tang of hers. Her secret ingredient was a dash of fresh ground nutmeg. She was a very typical modern Greek woman, but her cooking was pure tradition. I also recall her singing Tom Jones’ The Green, Green Grass of Home along with the radio while she worked. She kept her radio on the windowsill and I still have mine there, too. We had so much in common now that I think of it. I’ve often wondered what happened to her collection of bowls. I believe they were a wedding present. Does the person who got them ever know this? And what about the bowls I’ve seen in second-hand shops? Who owned and loved them? And how did they come to be abandoned? Did someone die? Or did they just stop loving their bowls? I’ve bought others since then. They started showing up and I found them cheaper by the way than the initial set I bought, but I found many of them at the fabulous Ros0e Bowl Flea Market. If you live in LA and you’ve never been, do yourself a favor and go. It’s on the second Sunday of every month. I’ve come to discover this is where Pyrex bowls go to die. Er, I mean, where they go looking for a second chance at culinary love. I found a wonderful bowl there years ago called the Friendship pattern. Others call it Cinderella but Pyrex calls it Friendship. 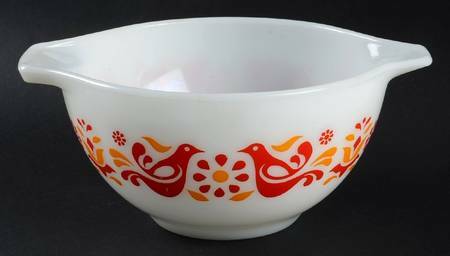 My bowl was white with red and yellow pictures of birds and a floral design. Very 50s. It was a thrill to buy it for $10 and I adored that bowl! I used it to mix pancake batter when my nieces and nephews came to stay and I loved the pouring handles. A couple of years ago I inexplicably broke it. I was stunned. I thought those things were indestructible. I immediately set out to find a replacement but the world has caught up with my Pyrex obsession and everything online was $50 and up. The Rose Bowl didn’t have them. I passed countless sellers with all kinds of Pyrex. I even found a set of bowls I’d never seen before and was thrilled to take them home. One is a lavender color and it’s my new favorite. So I kept looking for Friendship but couldn’t find one cheap enough. I couldn’t justify the cost. I kept checking eBay and local antique malls hoping I’d find some seller desperate enough one at a reasonable price — and then I gave up. Oddly, once I stopped obsessing and no longer looked, I found one. I was walking my dog one Saturday morning and a woman who lives at the end of the street was having a mini yard sale. I knew Ruth well because I walked by her place daily and we’d talk. She is an Orthodox Jewish woman who cooks all day for her family. She became the victim of urban development and her landlord evicted her so he could demolish the property an build a McMansion. She fought it for two years and I even went to court to speak on her behalf. But she lost the case and she and her invalid husband were forced to move. So there she was selling off kitchen items and I saw the devastation in her eyes. She had a Friendship bowl and she wanted two bucks for it. As much as I wanted it, I was worried I was taking a precious heirloom. “I’ll buy it and give it back to you,” I said. She wouldn’t hear of it. I gave her $5 which still wasn’t enough to be honest, but I took home the bowl, a huge grin on my face. I had to laugh because there was still food stuck on the outside of it. Maybe she gave it a quick rinse and really wanted to get rid of it. I don’t know. All I know is she is the same age my mother would have been if she were alive, and I feel I have strong tangible connections to both of them. The new Friendship has replaced the old one, but I still love them both. And with every meal I prepare with this well-loved bowl, I will think of Ruth and I will think of my mother. And the green, green grass of home. Do you have a favorite obsession? Please share and you will enter the draw to win a $10 Amazon Gift Card and a $25 gift card for yummy See’s Candies (available for us online and in-store). I too love to collect Pyrexware .. Obsession, hmmmm does books, and chocolate count? I love chocolate and sometimes depending on my moods ill go for the expensive or cheap. With books usually sci-fi, paranormal or even romance and that includes gay romance. A.J. I love your “Pirate” bowls! And the story. I’m happy you’re blogging again. And I am working on my Romance Series suggested by you and Rachael! The sailboat book will be number four in the series (if I go in order which I may not). I think I have to become obsessed with writing the stories of my six husbands in order to get it done. Thanks for writing! Love that you are blogging again. And love the story of the “Pirate” bowls. I think I will have to become obsessed with writing my series of Romance Novels based on the suggestions you and Rachael made. The sailboat story will definitely be included thanks to YOU, A.J. Carry on, thanks for writing, and thanks for inspiring and believing in me! Oh my God! 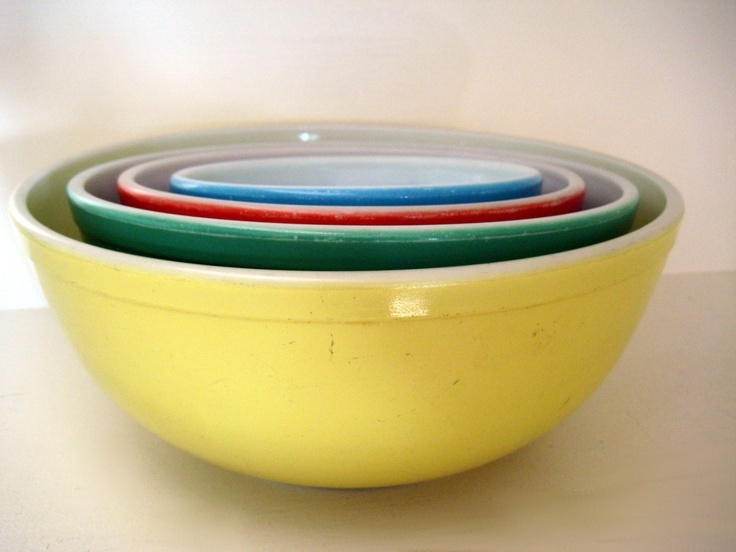 I used to have one of those yellow bowls. It was my mother’s and when she died, I grabbed it before my brother could get his hands on it lol. After all, I figured I had a lot of history with it. My mom used it for everything. It was the perfect size. And she taught me a lot of dishes that started out in that bowl. Unfortunately, my daughter dropped it and that was it. Gone in a flash. She felt terrible but I still miss that. I’m going to go check the places you mentioned. I’d love to replace some of those items. I’m so happy to see you’re blogging again,You were missed. I am obsessed with my Kindle and am searching my heart and the world for something else to add to my life . I’m still looking and hope to recognize it when it finds me. Thanks for posting everyone! Tracy Rowan won the prize. I’ll be doing this again next week. See you then!